Here in the West, there’s a certain wildness that still exists. You’ll find it in Montana and Wyoming’s wide-open spaces, national parks, rugged backcountry terrain and wilderness areas as you explore a part of the country that is unapologetically untamed and undiscovered. And for this Montana girl, that’s one of the reason I love Big Sky Country so much. It’s a place where my soul is absolutely free; a place where it feels that I may be the only person in the world to see this wonderfully wild place. And while the wildness the West offers is part of her charm and allure, it also means that she’s home to plentiful varieties of wildlife. 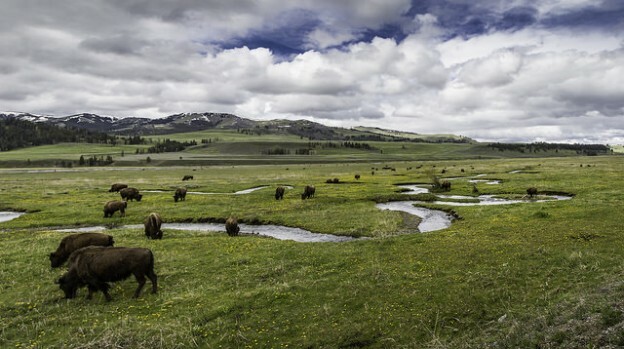 From massive bison in Yellowstone National Park to grizzly and black bears in Glacier National Park, Montana and Wyoming are two states where you can still see wildlife freely roaming through their home terrain. In fact, the opportunity to see a bison, moose, bear or wolf is a key reason that many visitors come to Yellowstone and Glacier National Parks. If you’ve been reading or watching the news from the last couple of summers, you’ve likely heard about the two incidents where two visitors to Yellowstone National Park were gored by bison. Both were accidents and I’m sure that the tourists didn’t mean the bison any harm, but the fact remains that both visitors were WAY TOO CLOSE to the bison. While park regulations state that visitors are supposed to stay at least 25 yards (75 feet) away from bison, both of the visitors were within 3 to 5 feet of the bison. And that, my friends, is way too close. Sidenote: Both of the visitors were treated for their injuries and released. In order to help all of us have positive encounters with Montana and Wyoming’s watchable wildlife in Glacier and Yellowstone, I’ve rounded up a few tips and guidelines to keep in mind when you’re out exploring the great outdoors. Wildlife is wild. While bison may look like giant, soft puppies and bears may look like they want to cuddle you, just remember this: they don’t. Do not approach them, try to pet them or touch them. Heck, if it’s easier, think how you would react if you were in their position. Would you like it if you were out for a nice dinner somewhere, hanging out with your friends and relaxing just to have someone aggressively come up to you, invade your space and started eating food off your plate? I’d say you wouldn’t love it. Follow the recommended wildlife viewing guidelines. Let’s be honest, we’ve ALL been tempted to get just a little bit closer to snag that perfect photo. And while moving in 10 feet closer may help you land that perfectly framed instagram photo, just don’t do it. Park regulations state that all visitors should stay at least 100 yards (the length of a football field) away from bears and at least 25 yards away from other large animals, including bison, elk, bighorn sheep, deer, moose and coyotes. Don’t trap them. Earlier this year, a video was released that showed a mama black bear and her two cubs being pinned on a bridge near Gardiner, Montana. The mama bear became agitated and started running (sometimes toward visitors) while trying to get her babies off of the bridge and out of harm’s way. It was likely a miracle that no one was injured and that this particular mama black bear was so calm. Let bears know you’re nearby. When hiking, be sure to hike with a buddy, stay on trails and make noise. Feel free to bust out showtunes or just say “Hey bear” loudly as you make your way along the trail. Trust me when I tell you they don’t want to see you on the trail just as much as you don’t want to see them. PS: For more safety tips on viewing wildlife, check out this post from last summer. This entry was posted in Uncategorized and tagged Glacier National Park, Montana, Watchable Wildlife on June 8, 2015 by tiatroy. Bison can be incredibly dangerous when they have calves too! I worked on a bison ranch a few summers ago and was bluff charged twice by a cow bison and I was way more than 25 yards away when she came at me. One of the scariest moments in my life. If you are chased though, just remember you can turn faster than any four-footed animal….. bob and weave! Good advice, it’s not always that easy though. What do you do when wildlife is standing on the road and you coming closer towards you and you can’t neccessarily back down all that easy?